Do your best to get it right the first time. Painting the bathroom is one of the simpler, more affordable ways to give your interior a quick makeover. The best aspect about painting bathrooms is you can quickly change and update the color scheme and finishes when the mood strikes you. However, some simple techniques concerning preparing the bathroom for painting as well as choosing effective colors and finishes make a fundamental difference in your bathroom paint job. 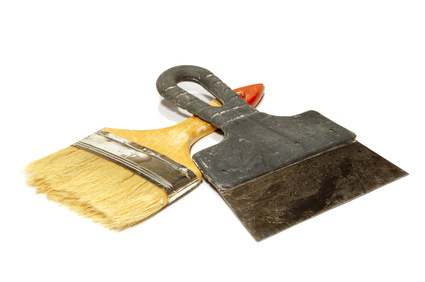 Preparing your bathroom for a new paint job ensures a smoother finish. Remove all hardware from doors, windows and walls. Carefully take off light switch plates and outlet covers, taping the accompanying hardware to the plastic covers so you do not lose it. Use caulk to fill any holes and fine grain sandpaper to sand away surface imperfections. Painter's tape helps keep lines straight and avoid painting onto window frames, door frames or segments with a different color. Many people like the clean, streamlined look of a monochromatic white bathroom, but you can achieve a similar effect with pale hues. Consider a cool tone, such as faded cornflower blue, stone gray, sage green or lavender, to make walls appear to recede. If you want to highlight an architectural detail or special element such as tile work or molding, echo its hue on an adjoining wall. Paint your ceiling with a less saturated color than the walls to give the illusion of volume. Bathroom walls' relatively small size mean brighter colors have a greater impact. For a bold effect, paint a single accent wall in periwinkle, mango orange, lime green or fuchsia and pick up the accent color with your bathroom textiles. Natural and artificial light play key roles in bathroom decor. Your bathroom paint color and finish can increase the effects of light. Use a semi-gloss finish on your ceiling and window frames to reflect light that enters the space. Some people also prefer a semi-gloss finish on doors, cabinets and molding because it's easier to clean. However, if you have repurposed, vintage, distressed or weathered wooden elements in the your bathroom, a semi-gloss finish is too glaring and highlights the surface imperfections. For these types of surfaces, use a matte or eggshell finish that has a softer, more textured look as well as more opacity.